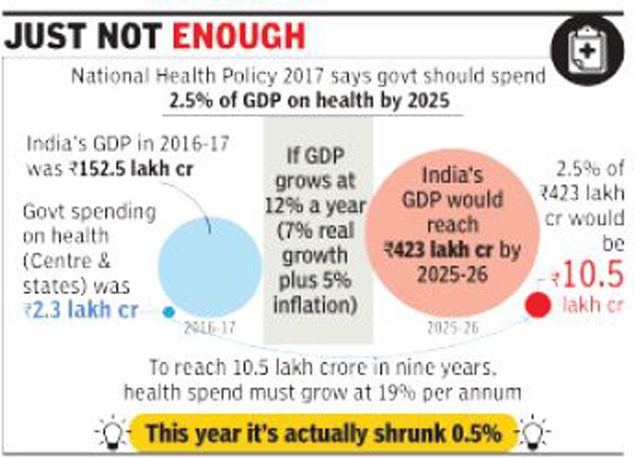 That National Health Policy 2017 says government spending on health must reach 2.5% of GDP by 2025. Simple back-of-the-envelope calculations show that to achieve that target, spending would have to grow from the 2016-17 level by nearly 20% year on year. But this year’s Central Budget actually sees a minor decline in outlays. The calculations are based on official data presented in this year’s Economic Survey. The GDP of 2016-17 is estimated to be Rs 152.5 lakh crore. If you assume a nominal GDP growth of 12% per annum (say, 7% actual growth plus 5% inflation) from 2016-17 to 2025-26, then the GDP would rise to Rs 423 lakh crore by that year. If 2.5% of that GDP is allocated to health, the combined health budget of Centre and states should be 10.6 lakh crore. To reach this level of allocation, the combined spending on health should grow by about 19%. If GDP growth is faster than the assumed 12%, health expenditure too will have to grow faster, i.e allocation will have to be even higher, to keep pace with it. Of course, this growth rate really applies to the combined spending by both levels of government, but assuming that both sides will need to stick to their part of the bargain, the Centre too would need to maintain this rate of growth in allocations. While the allocation of states on health, water and sanitation in 2018-19 is not yet available, if we combine central allocation for health, water and sanitation in this budget, it has actually decreased by 0.5% from Rs 77,305 crore to Rs 77,024 crore. That’s because even as the health budget has gone up, if only by 2.8%, that for water and sanitation has come down. Unless state budgets sharply hike health outlays this year, government health spending as a percentage of GDP will at best remain stuck at around 1.4%, and at worst could dip further. Considering India already has among the lowest ratios in the world, that would be alarming. WHO data shows that there are only about 30 countries, mostly in sub-Saharan Africa and India’s neighbourhood that allocate less than India does as a percentage of the GDP. Most developed countries like France, the US, UK and Canada spend about 8% or more of their GDP on health, while Germany spends about 9.5%. Among the BRICS countries, China at 3.2% was closest to India’s levels, the rest being significantly higher. Reflecting the impact of low government spending on healthcare, India has among the highest shares of out-ofpocket expenditure by households (65%) in total health expenditure. That figure is as low as 6.8% in France and in most developed countries is in the 11-15% range. Even among the BRICS countries, out-ofpocket spending is low compared to India, ranging from just 7.7% of total health spends in South Africa to 36.4% in Russia.